And when I was a kid, for breakfast I would eat breakfast cereal, it has some sugar on it, and I’ll have some orange juice, and low fat milk, which makes carbs, carbs, carbs and carbs. And I thought that was normal, day after day after day after day after day, the same thing. And when I was a kid, I’d go to McDonald’s and a McDonald’s burger was a little tiny patty of meat with a big bun on it, that’s carbs, and then there’s french fries which is carbs and a soda which is carbs, and if I was lucky then I’d get a reward and get apple pie, that’s more carbs — carbs, carbs, carbs, carbs. So you can see, you repeat these things all the time, you think it’s normal. So it’s time to uninstall some of those programs and make a new normal. 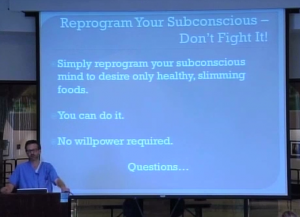 Reprogram your subconscious, don’t fight it. Don’t try and use willpower to fight something as big as this room. Don’t try to use the tiny little conscious mind to fight your subconscious. You can do it, there’s no willpower required. That was a short section. We’ll do some questions and then go on to the next section. The next section is long. Question from Audience: How come beans are so bad? Answer from Dr. Anderson: They’re just starchy. Beans, like green beans — green beans are not bad for you. Dried beans, which are like the pinto beans, the black beans, they’re just starchy. You can rank everything in terms of how bad it is for you. It depends on what your goals are. Let’s say you decide that what you’re gonna do is you’re gonna count carbs. If you’re gonna count carbs and lose weight then you can eat beans and count carbs. Counting anything did not appeal to me. I just wanted to know what I could eat and what I couldn’t eat, and then that way I could put as much of that on my plate as I wanted to. So I would eat beans, but if I ate beans I would eat very little beans. I’m not saying I did eat beans, I do eat beans but I eat very little. They’re just starchy, sugary. Question from Audience: What’s the difference in the carb that’s found in wheat and what’s found in lettuce? Answer from Dr. Anderson: Two things: number one, the amount. There are 92 grams of carbs in a cup of wheat flour. And there are about 1 gram of carbs or 2 grams of carbs in a head of letuce — so it’s the amount. So you could eat a hundred heads of lettuce before you got the amount of carbs you’re gonna get in your wheat flour. I’m just ball parking the carbs in lettuce, I don’t really know the number — maybe it’s 5. Maybe it’s 1, maybe it’s 5. So number one, it’s the amount. Number two is the type. Wheat contains a type of sugar called amylopectin-A. And amylopectin-A raises your blood sugar higher than most other carbohydrates. So she asked a question about beans. So what’s better, wheat or beans? Well, beans have amylopectin-C. Amylopectin-C is not digested very well. And so that’s why beans give you gas, because some of the carbohydrates pass through your digestive system and the bacteria in your digestive system turns those carbohydrates into gas. But wheat -, amylopectin-A, is rapidly absorbed and raises your blood sugar more than any other carbohydrate. That’s what’s bad about wheat. The thing about wheat is this: if you took wheat versus table sugar, wheat will raise your blood sugar higher than table sugar will. And in that book, Wheat Belly, he goes through it in detail. But basically, the amylopectin-A is rapidly absorbed. What do you think raises your blood sugar more, a Snickers bar or two pieces of whole wheat bread? Whole wheat bread. And that’s in that book, Wheat Belly. So that’s why you think it’s harmless, right? You know a Snickers bar is supposed to be bad for you — you know that. And so if you choose to eat a Snickers bar, you’re eating a Snickers bar because you’re choosing to eat something that’s maybe not healthy for you. But two slices of whole wheat bread, you think that’s supposed to be healthy and it’s not. Question from Audience: If you’re eating something, can you take some extra fiber … ? Answer from Dr. Anderson: No. Bummer. That’s the thing about a lot of diets and systems, is that they think that you can add something. They think that you can add something to make it healthier. But this isn’t about adding something, this is about taking something away. That’s basically why whole wheat bread is not really much better for you than white bread. Because you add the fiber to it but it still raises your blood sugar too high. Question from Audience: I enjoy a cocktail every now and then, what’s kind of a healthy cocktail? Answer from Dr. Anderson: I don’t exactly know the answer to that. I would say that you should learn what’s in whatever you drink, and I would learn what the net carbs are. For instance, a margarita can be a thousand calories — one margarita, a thousand calories. And it’s all sugar — sugar and alcohol — so it’s carbohydrate. Red wine would have less net carbs. Basically, gin and distilled spirits, red wine have less carbs in them than do beer, for instance. I would just tell you, Google it. If you’re gonna have whatever, look it up and see what it it has. Question from Audience: Net carbs is what I’m looking for? Yeah, we’ll talk about that I think that’s the next section. And you know the question can be either A, do I have to stop drinking or should I stop drinking? or B, do I just need to have low carb drinks? That’s kind of a decision for you to make on your own. For example, William Banting — we’ll go ahead and start Hour 5 — William Banting in his letter on corpulence 1869, he details what his diet was. And in his diet he had 6 alcoholic drinks a day everyday and lost 50 pounds and kept it off for at least six years. But basically what he did was he had low carb alcohol. Now, if your diet consists of one drink a day, then perhaps you don’t have to stop drinking. But if you think, “Maybe I should stop drinking,” well if you’re on a health journey, maybe now is a good time to do it.